Claim space for your brand in every recipient's office or home. With branded gifts and giveaway items, a simple mug or pen can make a big, lasting impression. 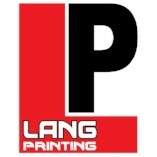 Lang Printing & Mailing provides commercial printing and large format printing, including banners and posters. We do it all - from large format printing to custom car wraps. Whether you need ideas on a proof or a quick turnaround, we are here to serve you! To place an order or get help with a new project, enter our online Customer Service Center. To download useful software and find helpful information, search our Resource and Support area. To learn more about us, browse through our Company Information section.